There's an All-Star team at the helm of this upcoming project with Christofer Emgard (The Whispering Dark, Mirror's Edte, Exordium) tagged as the writer, Fernando Baldo (Deep Gravity, Thief) as the artist, and Michael Atiyeh (Conan the Avenger, Green Lantern: Rebirth) as the colorist. The stylized cover art was also helmed by the talented J.P. Leon from DMZ and Static. For fans of the intense survival world given to us by Tom Clancy, Extremis Malis aims to take that narrative even further. 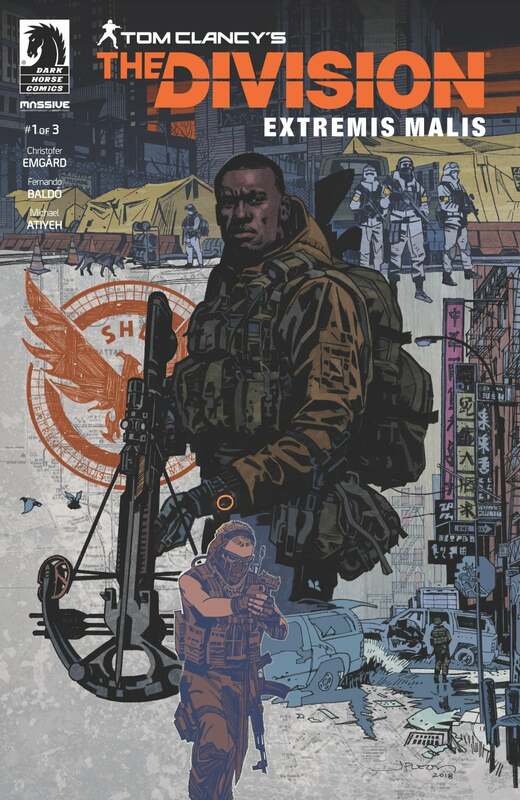 For more about this new comic series, Dark Horse tells us "Months after a bioweapon attack devastated New York City, the Division agents are the last hope of a United States struggling to hold itself together. During a mission gone wrong, Division Agent Caleb Dunne's partner is gruesomely killed and Dunne vows to track down the mysterious woman responsible. As he gathers clues to her wherabouts, he uncovers a grave threat to a nation already on the brink of total collapse." The first issue for The Division: Extremis Malis goes on sale January 9, 2019 and is now available to be pre-order! The promising new adventure will be available to pre-order at major retailers such as Barnes & Noble, Amazon, and others. You can also scoop it up at your local comic shop as well if you wanted to support local! Need even more The Division in your life before the new series arrives? You can learn more about their recently announced Art Book below, as well as how to get it right here with our previous coverage. Similar to that of the usual The Division design, this 192-page hardcover collector's item puts fans of the franchise right back into the decrepit streets of both Washington DC and New York City to learn even more about what it takes to survive. Dark Horse tells us, "Millions lay dead in the aftermath of a catastrophic biological attack, and the disease continues to spread. With infrastructure in ruins and DC on the brink of collapse, the agents of The Division are called to action as the only hope to restore order." Dark Horse added, "If the agents fail, the nation will fall. Don't miss this opportunity to learn all there is to know about the tactical methods, the high-tech tools, and the all-important mission of The Division!"